As those of you who have read some of past reviews will know, I’m a huge fan of the anime series Steins;Gate. So naturally, when I heard that there had been a Steins;Gate movie following the main series, I knew I would have to get my hands on it. I finally got the chance to watch it, and it was just as good and provided just as satisfying a sense of closure as I had hoped. Please note: I did my best to keep spoilers of the original series out of this review, but there are some unavoidable ones regarding a couple of the main plot points that conclude the series, so proceed at your own risk if you haven’t seen it yet! 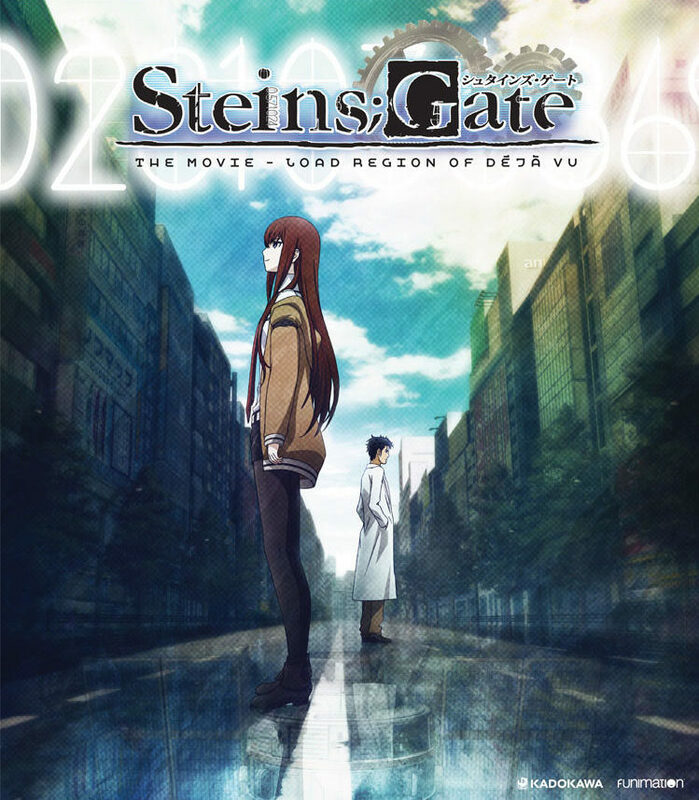 Steins;Gate the Movie: Load Region of Déjà Vu catches up with Okabe and the gang about a year after the events of the series conclude. Kurisu has just arrived back in Japan after another trip to the States, and the Future Gadget Laboratories group couldn’t be more pleased to see her. She jumps back into the daily routine of the lab, and it’s almost as though she never left. Okabe and Kurisu fall back into their pattern of affectionate, dramatic bickering almost immediately (much to my delight). But shortly after this time, strange things start happening that occupy Okabe’s attention even more than the fact that his beloved “assistant” is back. At first, Okabe thinks he’s having flashbacks to the time he spent jumping world lines the year before. Memories from defunct world lines (the diverging timelines that are created when someone tampers with time) keep superimposing themselves over reality, confusing Okabe’s understanding of what is real and causing him to overreact in certain situations. As this starts happening more and more, Okabe assumes he’s suffering from some form of PTSD, which would be more than understandable considering the severe trauma he experienced during his time travel. However, the truth is even more sinister—because Okabe is the only one who can remember everything from the different world lines he traversed, he’s unable to cope with reality as it now is. As a result, the pressure and dissonance of it all causes him to keep winking out of existence for short periods of time until one day, he vanishes altogether. Once this occurs, the only person who can really remember Okabe even existed is Kurisu; the film leaves it up to the viewer to decide whether this is by virtue of their close bond or just the sheer amount of time they spent together across the world lines. The others remember him faintly, but just as a sense of something missing, or an echo of some mysterious warmth that is now lost. Kurisu eventually “invents” (or rather, remembers) the time machine that got the gang into this mess in the first place and uses it to jump back to a time when Okabe still exists so that she can warn him and find some way to keep him in their reality. When Okabe learns what Kurisu has done, he’s livid, and he makes her promise to forget him and let him fade. He tells her that time travel is an abomination, and that he doesn’t want her to suffer as he did when he used it. Kurisu tries to heed Okabe’s last wish for a while, but before long, his absence becomes unbearable. Kurisu realizes that the true abomination is a world without Okabe, and she’ll do anything to keep him from oblivion. But will her efforts be enough? Or is she doomed to get caught in the same torturous cycle that Okabe did? I really enjoyed this movie, and from my perspective, it succeeded on a number of different levels. The first and most noticeable one is that watching it felt just like watching the original series. It reminded me a lot of watching the Sword Art Online film (which I reviewed when it was released in the US in March 2017) in that it immersed me once again in a world I knew and loved, answered at least a few of the questions I’d had following the conclusion of the original, and gave a satisfying sense of closure while still making me wish the story was going to continue. This film was also like the Sword Art movie in that I don’t think it’d work as a standalone; watching it without having at least a passing familiarity with the series would remove a lot of the emotional impact of the film, to say nothing of the key context. That’s not to say Steins;Gate the Movie wasn’t a great film, however. Clocking in at just an hour and 30 minutes, it is tightly plotted and packs a lot into a short time while still somehow maintaining the slow-build feeling of the original series. It also has the same high-stakes, high-impact feel, and it’s easy to understand why the characters are willing to go to the lengths they do—I found myself imagining I’d do the same, given the same resources and circumstances. Overall, it has one of the elements that makes a great sci fi: everything feels believable, from the characters to their motivations to the choices they make to the way things turn out, even in the context of a far-fetched setting. As a big fan of the original series, I have to say that my favorite part of the film was getting to see more of the characters I love so dearly, and this is where my ability to view it objectively breaks down. I could probably spend ages watching plotless content in which these characters are just hanging out in the lab, bickering, or living their strange lives together, so I’m predisposed to like this movie regardless. But I think the mere fact that I was able to have the same experience with the characters and find just as much joy in their antics and foibles as I did in the original is a testament to the fact that the film succeeded in what it set out to do. As mentioned, I wouldn’t recommend this movie to someone who hasn’t seen at least a portion of the original anime. However, if you loved the series as much as I did, I think you’ll find this epilogue to be a fitting and enjoyable wrap-up to a great series.